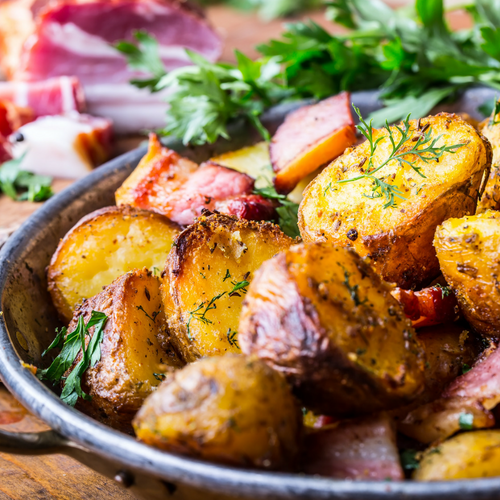 Clean and slice potatoes with skin on into 1/4 to 1/2 inch pieces and keep in cold water until ready to prepare. Mix the oil, garlic, Italian seasoning, salt and pepper in a Ziploc bag. Add potatoes to Ziploc bag and shake vigorously until all potatoes are coated. Let marinade for 5-10 minutes, flipping over once. Line a rimmed cookie sheet with parchment paper and pour out potatoes into an even layer on the cookie sheet and place in oven. Roast for 20 minutes uncovered, then flip potatoes over in pan so crispy side is up. Roast for another 15-20 minutes until the other side of potatoes are crispy and golden. Sprinkle with fresh herbs, if desired. Serve hot and enjoy! If there are ever leftovers, we like to fry them up. Add 1 TBSP oil to hot frying pan on medium-high heat, add potatoes and cook until heated through, stirring occasionally. Have mercy!